In this section we will discuss surface area of cone. Cone : When we increase the base of square pyramid that base becomes circular and the figure changes to cone . In real life we use this shape in funnel, joker’s cap etc. Its base is circular and has a curved surface. Vertex : The fixed point A is called the vertex of the cone. Axis : The fixed line AO is called the axis of the cone. Base : At the bottom there is a circular shape which is called the base. Height : The Axis AO is also called the height. Slant height : The length of the line joining the vertex to any point on the circular edge of the base is called slant height. It is denoted by ‘l’. In the above diagram AC is the slant height. Radius : O is the center so OC and OB are the radii. 1)	The diameter of a cone is 16 cm and its height is 6 cm. Find the surface area of cone. 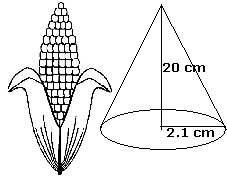 2)	A corn cob somewhat like a cone, has the radius of the broadest end as 2.1 cm and length as 20 cm. If each 1 cm 2 of the surface of the cob carries an average of 4 grains, find how many grains you would find on the entire cob? So, there would be approximately 531 grains on the corn cob. 3)	A tent is of the shape of a right circular cylinder up to height 3 m and then becomes the right circular cone with a maximum height of 13.5 m above the ground. Calculate the cost of painting the inner side of the tent at the rate of $2 per sq. m., if the radius of the base is 14 m.
Hence, the cost of painting = 1033.06 x 2 = $2066.12 = $ 2066.